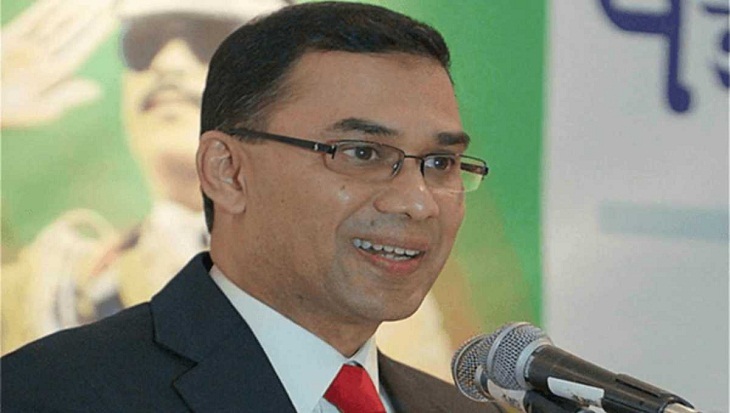 Leaders and activists of Bangladesh Chhatra League (BCL) on Wednesday demanded death penalty for Tarique Rahman who was awarded life-term imprisonment in the 2004 grenade attack case, reports UNB. BCL members came up with the demand after the verdict of the case which sentenced 19 people, including former state minister for home Lutfozzaman Babar to death while BNP leader Tarique Rahman and 19 others life-term imprisonment for the grenade attack on an Awami League rally on August 21, 2004. Expressing dissatisfaction over the verdict, BCL leaders said they would wage movement demanding capital punishment for BNP acting Vice-chairman Tarique Rahman claiming that he was the mastermind of the attack. Under the banner 'Dhaka University against Terrorism', a sit-in protest program was held on the university campus where BCL central committee president Rezwanul Hoque Chowdhury Shuvon, general secretary Golam Rabbani, DU unit president Sonjit Chandra Das and Saddam Hussain were present. Quoting BCL President Shuvon UNB said, "We are not satisfied over the verdict as mastermind Tarique Rahman has been given life imprisonment instead of the death penalty." "So, we demand Tarique Rahman be brought back home and award him the death sentence." He also said the BCL men will submit a memorandum to the government and continue the movement to press home with the demands.